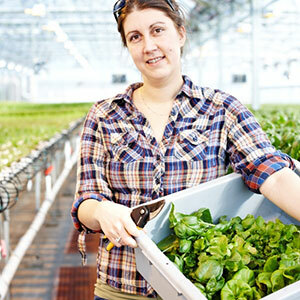 Gotham Greens worker harvests lettuces from the company’s Brooklyn greenhouse. Since 2008, Brooklyn’s Gotham Greens has been working hard to make a difference in the lives of New Yorkers. As an urban farming pioneer, the for-profit company has established two large commercial farms in the city to meet the demand for fresh, wholesome, local produce. In the process, it has served as a pioneer in the rapidly evolving world of urban agriculture. Gotham Greens established its flagship farm in Greenpoint, Brooklyn in 2010. It was the first commercial-scale rooftop greenhouse of its kind in the United States. Designed, built and operated by Gotham Greens, the greenhouse boasts more than 15,000 square feet, where the company produces more than 100 pounds of leafy greens annually. From this site, Gotham Greens grows 10 different types of lettuce, leafy greens and herbs including Butter, Oak Leaf, Lolla Rossa, and Basil. Just last month, Gotham Greens unveiled its latest greenhouse, which was built on the rooftop of the Gowanus, Brooklyn Whole Foods Market. Measuring more than 20,000 square feet, the greenhouse will allow Gotham Greens to grow more than 200 tons of greens, tomatoes and cucumbers per year. This Whole Foods location and the Gotham Greens greenhouse will include a 157 kW Combined Heat and Power plant and a 325 kW solar photovoltaic system, and will utilize high efficiency, zero-ozone depletion, HFC-free commercial refrigeration systems. At both of its greenhouses, Gotham Greens is using recirculating irrigation systems to reuse water. The company grows lettuces that are free of pesticides, herbicides or insecticides, relying instead on integrated pest management and beneficial insects. With two urban farms in operation, Gotham Greens is working toward opening a third, a 60,000-square-foot rooftop greenhouse in Jamaica, Queens later this year, as well as other greenhouse projects beyond New York City. “The goal is to develop additional urban farms in New York City and other urban areas, and to grow an even greater diversity of fresh produce for even more urban dwellers and city residents,” explains Puri. Gotham Greens has operated at the cutting edge of for-profit, ultra-urban agriculture from the start, according to Puri, and as a result has had to chart its own course. But, for Gotham Greens, the challenge of starting urban farms is just one step in their larger overall mission to empower city residents and contribute to the Big Apple’s sustainability profile. “Urban agriculture has several important roles to play: increasing local food supply and self-sufficiency, connecting urban dwellers to food production, creating economic and community development opportunities, job creation, pedagogical benefits for children and adults alike, ability to improve public health, creating urban green space, reducing the urban heat island effect, and capturing storm water runoff,” says Puri. While Gotham Greens is not the only company working toward these goals, it is certainly one to which other aspiring urban farmers can look for inspiration and education. Puri suggests those interested in getting involved in farming first apprentice and learn the craft first. “Don’t underestimate the science and technical ability required to grow plants and crops,” he says.